Angeli-The Pirate, the Angel and the Irishmen is a wonderful story that plays with several genres mixing them perfectly. This story boasts everything from fantasy and suspense to time traveling with some history thrown in. Our main heroine is Anne Bonny, a 300 year old pirate turned sentinel tasked with the protection of humans and destroying evil angels aka perfidia. Anne doesn't do this job alone, with the help of her Arch Angel Michael, fellow sentinel Con and assistant Jeffery she travels the world tracking down evil. Michael is the handsome angel who has an on and off again relationship with Bonny, not sure how to or if he even wants to have a real relationship with her. Poor Con wants to be with Bonny, but has a hard time keeping his hands on a body. Jeffery is very much the comic relief, he's young, obsessed with pirates and not afraid to pull pranks on our heroine from time to time. The story starts out in the present introducing our heroine and what she's up to in the world today, but quickly slips into the past. For the first portion of the book the story stays in the past quickly jumping from one event to the next. it's super easy to follow though because Ms.Vansant has made the events appear like journal entries providing dates and places so we know what's going on. During this time we learn how Bonny became a sentinel and how her relationships with each man progressed. I thought it was a wonderful idea to fill out the background this way, you get everything you need to know and can see how Bonny changes over time. Anne Bonny is probably one of the best, if not THE best sentinel the Angels have working for them, but all her talents may not be enough to beat this new foe. It's present time and a mass graveyard holding hundreds of bodies is found underground, only problem is there's no way in or out. They're not facing another normal perfidia anymore, this monster is like nothing anyone has seen before. While everyone's trying to hunt it down and figure out what it could be, it's got it's eyes set on Anne Bonny. 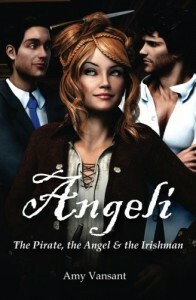 Angeli-The Pirate, the Angel and the Irishmen has become a new favorite of mine! I love the mix of characters an the fun that comes along with them. It's such a fun idea to mix pirates, angels and together, and move together through history and see what happens. Ms. Vansant did a marvelous job creating a story that leaves you wanting more. She's created a fantastic blend of mystery,action an humor in this quirky tale of a Pirate sentinel. I received this book in exchange for an honest review, these opinions are my own.